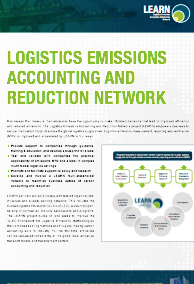 The Logistics Emissions Accounting and Reduction Network project (LEARN) brings different actors together to empower business to reduce their carbon footprint across their global logistics supply chains. We are now half-way and are pleased to share our achievements to date on improving logistics emissions measurement, reporting and verification. The recommendation is to develop a declaration that provides assurance on calculations being done correctly and consistently, and on the maturity and credibility of input data from different sources. This will allow companies to indicate their level of adoption of the GLEC Framework and increase transparency of their logistics GHG emissions (according to GHG Protocol scope 1, 2 or 3). Rather than creating a separate eco-label, it will be more impactful if the KPIs covered by the declaration are used by companies, green freight programs (e.g. SmartWay and Lean and Green), corporate GHG reporting initiatives (e.g. CDP and GRI) and broader product labels (e.g. EnergyStar). At present, 18 companies have started with the testing and validation on the use of the GLEC Framework; how results can be used for reporting and decision-making; and the usefulness of an eco-label. While testing will continue until end 2018, initial results show that companies are generally satisfied with the GLEC Framework as a calculation methodology and are already in a position to suggest improvements. The data aspect is more challenging, especially determination of the volume of transport activity. Companies have already come forth with specific conditions for eco-labeling (or input into one) to be meaningful and acceptable to business. Agreement has been reached on the development of an ISO standard covering ‘Methodology for calculation and declaration of energy consumption and GHG emissions of transport services (freight and passengers)’ together with the update of the existing EN 16258 under the Vienna Agreement. Such a global standard, e.g. in the format of an ISO standard, would build a basis for an emission calculation and a related data quality assurance process. This process will continue beyond the LEARN project until 2021 and contribute to the wider acceptance by the public and private sector of harmonized logistics emissions accounting. This report presents an approach for closure of methodology gaps to enhance emissions disclosure (required for reporting to stakeholders and as input into programs/initiatives and label schemes). Key gaps are developments toward finer granularity and improved data quality including the development of quality assurance. The approach covers transport mode specific gaps and more generic gaps of data quality, data communication and data quality monitoring. It provides the basis for the development of a research agenda during 2018 that maps the steps needed from a research perspective to fill priority gaps. A training curriculum and initial training materials were developed for road freight carriers in three different languages (English, Spanish and Romanian) based on the results of a survey among stakeholders. The course was developed as a half- or 2-day classroom training and 1-hour webinars that will be tested in spring 2018. Main modules are: business strategy; supply chain strategy; verification and certification; best practices; policies and standards; strategies for companies and customer management; available tools for emissions accounting. The survey itself can also be used to expand training to other areas and stakeholders in the future, such as Master students, cargo owners, and governments. A ‘network of networks’ is in the making that leverages existing channels of LEARN partners and can continue beyond the LEARN project. This started at the 1st LEARN International Workshop of March 2017 and continues through exchanging news, events and publications with stakeholders and maximizing the presence of LEARN partners in various events. As a result, key LEARN communication messages that contribute to wider uptake of logistics emissions accounting are reaching more companies and stakeholders at the senior and operational levels. Partnering in activities and events during 2018 with other EC-funded projects – e.g. ALICE-ETP, NexTrust, AEOLIX, SELIS and EUCalc – will increase further reach.